Recent News: " IEC Lock (Scolmore) recently won a Patent Legal Case against copyists "
IEC Lock is the unique Locking IEC system where the IEC Female will lock onto almost any standard IEC Plug securely to help protect accidental disconnection of power cables thus helping you to protect computer systems and other vital equipment. KVM Choice are officially UK Authorised suppliers of IEC Lock products and our IEC Lock product range are warranted for sale and use in the UK, warranties fully supported by IEC Lock. Please check the warranty status of low cost imports which may have warranty issues, for details contact us. 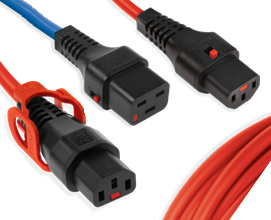 IEC Lock cables are now recommended to replace almost any standard cable connection of C13-C14 or C19-C20 to provide a secure connection. Data communications are available for both 10Amp and 16Amp connections. Locked in power connection's help to reduce accidental disconnection in many Data Centres where dense cabling to servers is common place, and any disconnection can be highly costly. Medical equipment in Hospitals is often vital and it can be critical if power cut's off. The broadcast industry has always had demanding cable links and cables often get pulled or kicked out from mobile equipment both indoor and out, IEC Lock solves one part of the problem and is available in high visability colours. Motor racing and other sports require equipment to be connected on and ready at all times or that vital time is lost, IEC Lock is now a favoured choice of many Formala One teams to secure power cables to pit equipment. 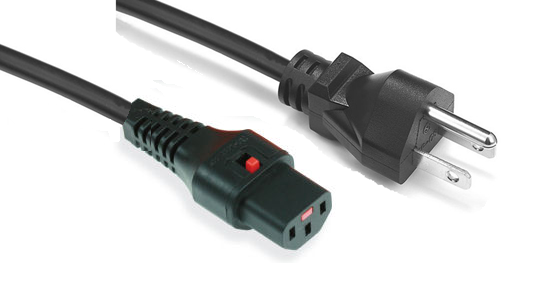 Many devices are hard to reach behind and any a power cable coming loose can be a usual problem, so almost everywhere we look and every piece of equipment with an IEC connection is better connected with an IEC Lock cable. 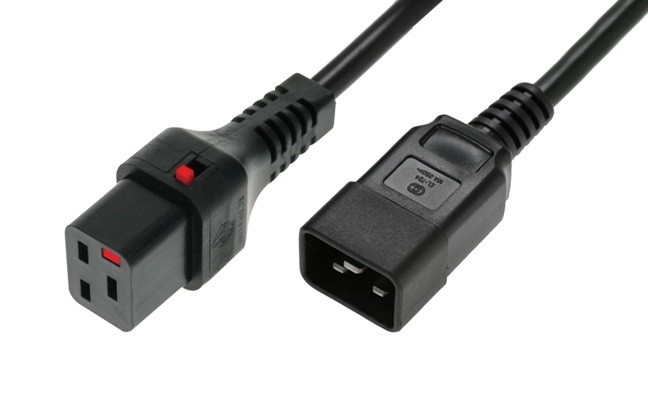 KVM Choice keep stock available of most common lengths and colours and we are constantly adding to the range, or building to order special lengths or different connector combinations so call us now for price and availability if you cannot find what you are looking for straight away.